If you follow along with Treasurer's Candidate Bob Grogan on Facebook, you saw this post to his Wall yesterday. He seemed particularly bitter about the Daily Herald endorsing his opponent: Tom Cross for Illinois Treasurer. We weren't the only ones who thought this particular outburst seemed odd. This isn't the first time that something has gotten under Bob's skin (see the photoshop incident! 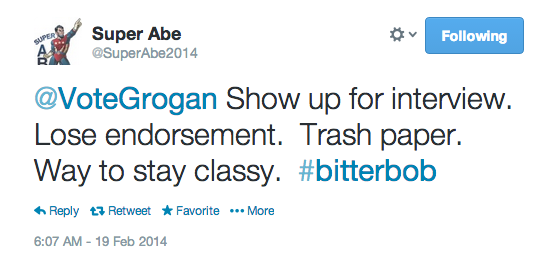 ), but SuperAbe also noted Bob's take on him not getting the Daily Herald Endorsement and summed it up well. 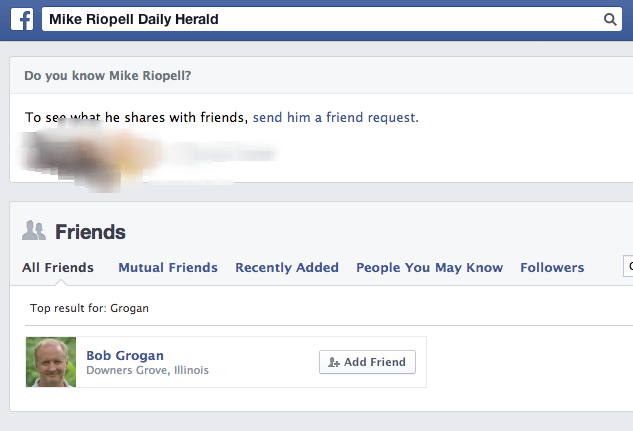 We know Bob Grogan actually did show up for the interview at the Daily Herald. And...anyone in politics knows that the only reason to show up for an endorsement interview is because a candidate wants to get that endorsement, right? So...Bob was there, but how do we know? Oh...that's right. His Facebook Wall again. So...let us get this straight. 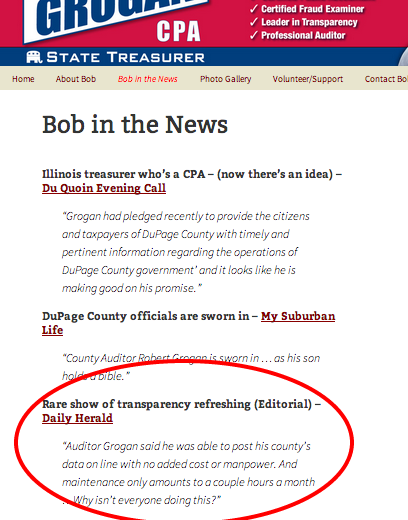 Daily Herald is the devil in Bob's book, right? I mean they endorsed Gore, Kerry, and Obama? Guess Bob wants us to totally discount the Daily Herald, right? On Sunday, the Chicago Daily Herald, the second largest daily newspaper in metropolitan Chicago, endorsed Mitt Romney for President in 2012. In 2008, the Daily Herald endorsed hometown Senator Barack Obama for President. Oof. Second largest paper? And...Bob forgot to mention that they endorsed Romney last time around? Who else has the Daily Herald endorsed recently? Kirk Dillard for Governor. Who's supporting Dillard? The very same Bob Grogan. 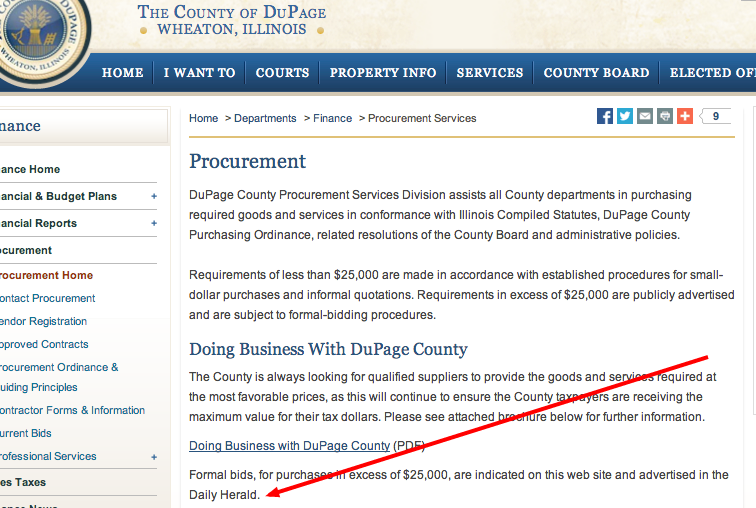 Remember folks: The Daily Herald doesn't matter. That's what Bob Grogan wants you to know. So...I guess it would be tough for him to explain how he prominently features an editorial FROM THE DAILY HERALD on his campaign website? That would be the very same Editorial Board that he badmouthed. Guess Bob will be taking that blurb down, right? Oh...and...Bob Grogan says that he wouldn't want the endorsement anyway? Seems like he's been cozying up to the Editorial Board (who gives out the endorsements) and the political reporters at the Daily Herald who cover his campaign. 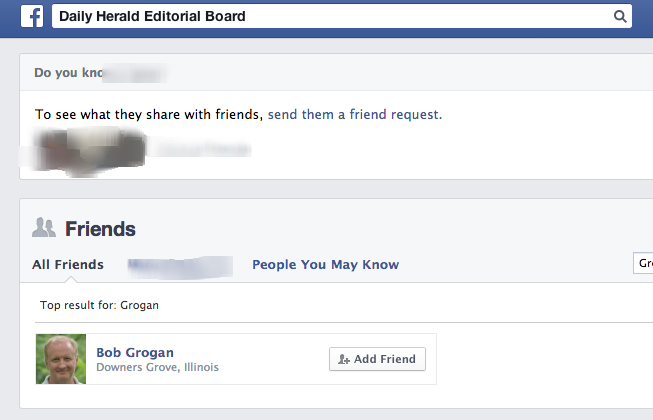 We took a look at the Facebook pages of the Daily Herald Editorial Board Facebook page, the page of Jake Griffin, a political reporter at the Daily Herald and the page of Mike Riopell, another political reporter at the Daily Herald. Guess who's 'friends' with all three? If you guessed "Bob Grogan"....ding ding ding....you win! So the guy who showed up for the endorsement interview, lost the endorsement decided that it would be a good move to badmouth the paper. Even after he 'friended' the folks who work there. That would be enough, but unfortunately for Bob Grogan it isn't. 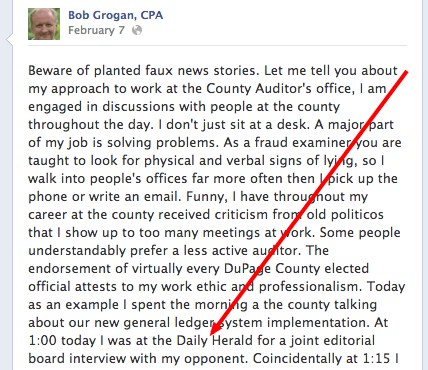 As you might be aware, Bob is the DuPage County Auditor. And that means he's an elected official for the DuPage County Government. As a unit of Government, they have to place their public notices in a newspaper so that the public can be aware of their activity. You'd think that they would pick a newspaper that they respect. 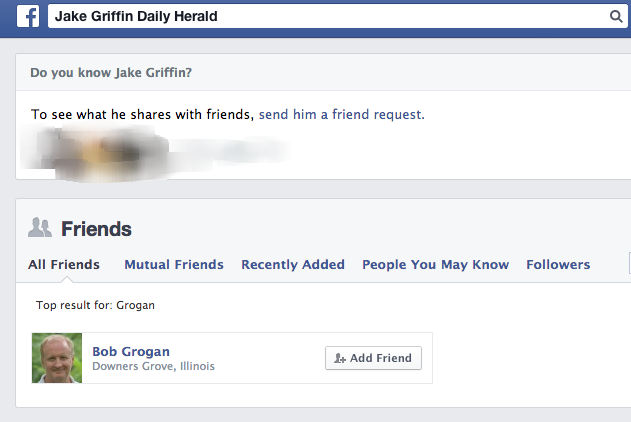 One that has a lot of reach and influence into the lives of the people of DuPage County, right? That paper? The Daily Herald. Too bad for Bob Grogan. We should all discount the Daily Herald after all, right?